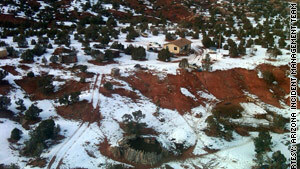 Some people have been stuck in homes in remote mountain areas. (CNN) -- A bulldozer operator driving along a quiet, snow-covered road inside the Navajo Nation territory in northeast Arizona in recent days saw an unexpected pathway on a hill. He soon discovered a mother and her two children making their way toward him, after struggling for nearly a mile through deep snow that had trapped them inside their home for at least two days. The driver gave them food and water and called for help. The trio was picked up by a rescue helicopter, said Eric Neitzel with the Arizona Division of Emergency Management. A bevy of emergency teams and equipment has been on an urgent relief mission since January 21, when a major storm hit the Navajo Nation and the much-smaller Hopi Reservation that it surrounds. The snowfall is forecast to taper off Thursday night and Friday, Neitzel said. However, officials expect the relief effort to continue until Sunday or Monday. As much as an additional foot of snow fell overnight in places like Tuba City, Arizona, Neitzel said, prompting air drops of more Red Cross blankets and 4,000 deliveries of food. The blankets are delivered to distribution points, where they are picked up by one of four Army National Guard helicopters. The National Weather Service said Sunrise Mountain had 10 inches of snow overnight. A rancher near Tuba City reported he was having trouble getting food for his sheep, and his horses and sheep are having a hard time moving in the snow, leaving them open to potential attacks by cougars, Neitzel said. The reservations, with rugged terrain and altitudes of more than 7,000 feet, are buried in up to 8 feet of snow, Neitzel said, and many of the Native Americans live on the mountainsides, where many homes are nearly impossible to see from the air. The snow has caused collapsed roofs and has stranded people in their homes. Native Americans have been using mirrors and other bright items to signal that they need air drops of food, water and medicine. As the ravages of the falling and blowing snow continue, there are new missions for the planning center in Holbrook, where Neitzel is based. "People are starting to be noticed missing" by neighbors and relatives who are worried because they haven't seen someone, he said. There also are more calls for paramedics to bring people to hospitals, said Neitzel. A medivac helicopter from the National Park Service at the Grand Canyon is on standby. Neitzel said this is the most extensive aid effort he can recall. In 2005, 4 feet of snow fell on just one portion of the reservations, but no airlift was needed. Last year, a thaw caused serious flooding, but the local residents handled the problem, he said. Last week's storm dumped 54.2 inches of snow on Flagstaff in the seven days ending Sunday, causing President Obama to declare a state of emergency in Arizona. That's the most snow for the college town since 84.6 inches fell in 1967, according to the National Weather Service.